VERY EASY – This 5-Stranded Collar and 2 other necklaces are made from 4-stitch I-cord. 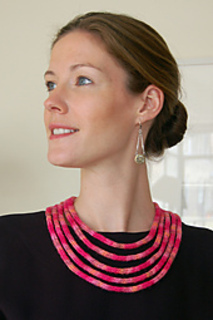 This stunning collar will add the finishing touch to a little black dress or a turtle neck top. It closes at the back with beads and a clasp. There is a close up photo (see left) and a detailed list of finishing materials and instructions on page 2 of this pattern. Another necklace is a timeless Knotted Loop worn twice around the neck, with illustrated instructions for the Chinese knots included. The third necklace is a Single Loop to display your favorite medallion or good luck charm, and it is the easiest of all! Sewing on all three designs is minimal. Lightweight sport silk is used for the models in these photographs but bamboo or cotton would work equally well.